Ideally situated at the heart of Parisian way of living, the Hotel Saint-Paul Rive Gauche belongs to a Franco-British family, hoteliers for 4 generations, who have made the hotel a marriage of French elegance and English comfort. The 31 bedrooms are colourful and range in style from the modern – vibrant flowered fabrics - to the traditional - exposed beams and elegant opaque curtains. Entirely renovated in 2015, this boutique-hotel is close to everything, in the heart of the action, but in a quiet little street. The Luxembourg gardens vicinity and the walking distance sites like the Sorbonne, Notre-Dame cathedral and the Louvre, make the Hotel Saint-Paul Rive Gauche a convenient pied-a-terre for enjoying the city. Italian chic and Parisian haute couture combine at the iconic 5 star hotel Castille. Standing alongside the legendary Chanel Maison, in the heart of the 1st Arrondissement, this romantic hotel is so Paris. Every detail has been lovingly restored to exude the opulence of its 18th century glory days, yet still retain a charm that you rarely find in a central Paris luxury hotel. With its 108 rooms divided in two wonderful wings, the Castille is a luxuous boutique hotel where the past and the present of Paris live together. You will be thrilled by the elegance of the contemporary style and the breath-taking view you can enjoy from the rooms of the Opera wing. In the Rivoli wing of the hotel you will find instead the classic French style of the 30's. 'Giving a hotel the soul of a home.' These are the words of the interior designer Charlotte Ferrero, to whom we owe the interior of Le Petit Chomel. Completely renovated and refurbished in 2014, this hotel in the heart of Paris is surrounded by iconic landmarks, tourist attractions and places of cultural and artistic interest, yet has everything you could wish for in a home away from home. So we invite you to think of our delightful hotel as your home in Paris. Elegant and welcoming, our hotel is decorated with antique furniture and offers 23 guest rooms, each boasting a similar level of comfort but each being distinguished by its furniture and decor. 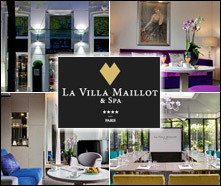 Hotel BEST WESTERN A La Villa des Artistes offers an intimate atmosphere in the most elegant part of Paris' left bank . Enjoy a relaxing walk in the Luxembourg Gardens and Saint Germain des Pres, both located only few minutes away. The neighborhood offers a wonderful mix of shops, theatres, cabarets, restaurants, including some of the most famous brasseries (La Coupole, Le Dome, La Rotonde). The hotel is located in the street where Modigliani had his studio. In the 30's, the hotel accommodated many artists including Beckett, Fitzgerald and Modigliani. Every morning the delicious buffet breakfast is served in the conservatory or outside amongst the peaceful garden. 54 non-smoking rooms are spread over 5 floors with full air conditioning, en suite bathroom, free WIFI access, tea & coffee facilities. Several room categories depending on your requirements: Classic, Superior, Deluxe, Triple and Duplex Suite. They have been entirely renovated and dedicated to the modern arts. Each room has its own special atmosphere of different artistic periods such as Fauvism, Cubism or Surrealism... to be seen!! In the heart of the famous meeting point for artists, painters, writers and poets, a few steps from the Luxembourg Gardens. You will be warmly greeted in our establishment from where you will explore Paris from all its angles, you will relax yourself at the bar with your friends after a long lively day. You will agreeably begin your day with a complete breakfast served between from 7:00 and 10:00 am. Between Montparnasse train station and the Luxembourg Gardens, the Hotel de la Paix is ideally situated facing a woody boulevard with an open view. Welcome to Hotel Lumen Paris Louvre, where elegance and design come together in carefully designed rooms, and every piece of furniture meets the seductive presence of light, with contemporary taste and charming recollections of the past. Just steps from the Louvre and the Tuileries gardens, Hotel Lumen Paris Louvre tickles your senses and makes you the center of attention in an exclusive setting, surrounded by the magic of Paris, the cordiality of a highly professional staff and the superb cuisine of its restaurant. Sweet dreams are made of this... Imagine being with your loved one in Paris, the most romantic city in the world bathing in the cosy and intimate atmosphere of the Hotel Britannique, basking in the peace and comfort that emanates the minute you cross its threshold. Savour the moment, here in the very heart of Paris, enjoy the luxury of this bijou Hotel, a stone's throw from the river Seine where lovers stroll and riverboats glide by in the shadow of the awe inspiring Notre Dame cathedral and the gilded City Hall. In the heart of Paris, close to the Grands Boulevards, the Department Stores (Galeries Lafayette and the Printemps) and Opera, the Hotel Aida Opera offers 58 air-conditioned rooms. In all these quiet and large rooms, equipped with bath or shower, you will find satellite TV, minibar, individual safe, direct phone with modem connection and hair-dryer. Its 58 quiet and large rooms are fully equipped with flat screen TV, fridge, individual safe , direct phone with modem connection, wireless access, hair dryer. Our three star hotel (new standards) is located in a quiet street in the centre of Paris, near the Grand Louvre and two minutes from the Place de l'Opera, in a district that offers business, tourism and shopping. Our friendly staff will welcome you on your arrival and will make every effort to make your stay as pleasant as possible. Our 36 high quality rooms have been equipped with everything necessary for a comfortable stay. The walls are decorated in gentle pastel tones that combine perfectly with the room's colour scheme. An elegant hotel on the Left Bank in Paris, the 7 EIFFEL welcomes its guests in a setting of contemporary luxury. A great deal of care has been taken in refining the details that make up this hotel and its resolutely stylish and welcoming atmosphere. Select interior design and attentive service are united here to please the most demanding of guests. Whether you are on a business trip or simply eager to see the sights, the 7 EIFFEL offers you a refined setting for your urban jaunt. On the top floor of the hotel is a hidden terrace garden, perfect for enjoying the view over the rooftops of Paris. The 7 EIFFEL, in the heart of the 7th district, is in harmony with the singular personality of this area of Paris, with it discrete elegance and a lively atmosphere. Located below Montparnasse TGV Station and Saint Germain des Prés (centre of Paris), close to Subway, typical restaurants and theatres, this 19th Century Residence enjoy a pleasant situation facing the charming Gaston Baty square in the centre of a bushing area.The Hotel Du Parc Montparnasse is above all a family business. Here welcoming is a passion inherited from generation to generation since 1972. A professional team and a warm welcome assured by the personal attention of the owners themselves, regular guests: enjoy a Parisian quality of life and the feeling to be 'at home'. Located in a peaceful residential area, this Citadines property is only a 5 minute walk from the Trocadero. Business travellers will be pleased to know that it is just a short walk to the Kleber International Conference Centre and businesses around the area. To relax, stroll through the gardens in this area, and admire the view - they overlook the River Seine opposite the Eiffel Tower. From here, you can also enjoy the scenic walk to the Musee de l'Homme (Museum of Mankind) and the Musee de la Marine (Maritime Museum).